I’ve been thinking about my past dating relationships a lot lately. Some of my relationships were great while others were down right scary, red flags lining the entire thing. 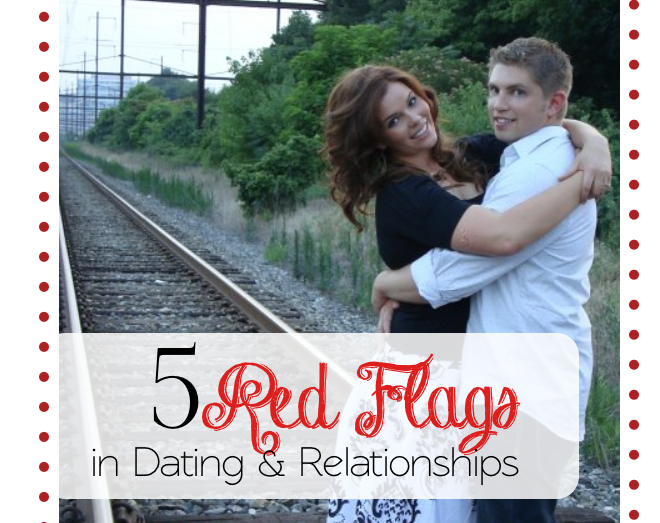 Looking back, I can see those red flags so clearly and wanted to share my TOP 5 relationship red flags. If my thoughts help one person remove themselves from a bad relationship/situation it would be worth posting about it! My husband Nick and I when we were dating. Awww, so cute. Have you ever felt like you needed to act differently around a certain group of people or especially someone you are dating? This can go multiple ways: acting in a way that is superior to others (judging everything about everyone else) not being yourself (toning down the silliness) or acting too crass. If the person you are dating makes you feel like a less than acceptable version of yourself in public or private settings, RUN! I always felt like I was too silly and embarrassed some of guys I was dating. But honestly, I love being silly (while respecting others.) Laughing and having a good time are very important to me and my happiness. Choose to be with someone that makes you feel great about being and expressing who you truly are. Bonus points if you want to be a better person because of the guy you are dating. 2. RED FLAG: You fight dirty. If you can’t get along with the person you are dating you may need to reevaluate the situation. Disagreements, differences in opinion and not getting along are all part of life with another person. If you are fighting and arguing when you are dating it will only worsen with time and be magnified if and when you marry. REMEMBER: You are usually the best version of yourself in the beginning of a relationship. If a situation escalates to the point of abuse: verbal, physical or any other kind, RUN! No one should endure any of that! I stayed in an abusive relationship (way too long) because I was constantly told that no one else would ever love me and other lies like I was abandoning him when he needed me the most. I knew they were lies but honestly thought it was easier to stay with him than have to pick up and move on. This was the biggest lie of all. LADIES: You deserve a man that is going to love and respect you when things are good and especially when they’re not. I was surprised to learn that there is a way to disagree and not fight. 3. RED FLAG: Breaking up and making up is a weekly occurrence. This one goes hand in hand with RED FLAG #2. I would have moments of courage during a bad fight and break it off, that was quickly followed by loneliness and eventually relapse. If you want to put and end to the cycle of breaking up and making up you have to change something. Don’t expect this to be easy, its not! Surround yourself with a strong support system and set strict boundaries whenever possible. One of the reasons it took me so long to get out of a bad relationship is because I had zero support. It was always a quiet breakup, no one had to know. That is the WORST kind, because its way to easy to get back into old habits. 4. RED FLAG: Your friends/family aren’t excited about him. Their reactions are less than enthusiastic and you feel defensive. Stop right there! This is a tough one because its hard to not take this situation personally. After all, you don’t want the most important people in your life to think you have bad judgment. If they would just give him a chance they’ll see why he’s so great and why your crazy about him! Remember: Your friends and family are not in like/love with this guy and can see things that you might have missed. If you trust your family, you might want to dig a little deeper on what they’re thinking. 5. RED FLAG: You feel like you can beat the odds, love conquers all! Im not saying that you can’t make it work against all odds, I’m simply saying its a lot more work. And yes, all relationships are different so make sure it works for your unique needs and situation. What things have worked/not worked in your past or current relationships?